Straightforward and nonjudgmental advice for dating couples, partners, husbands and wives, in-laws, counselors and others. Interfaith relationships are commonplace; the challenges that go along with them are not. An interfaith couple will have to confront tough questions, yet it’s often difficult to find answers, especially when traditional sources of help—family, friends, clergy and counselors—are unable or unwilling to understand the problems. 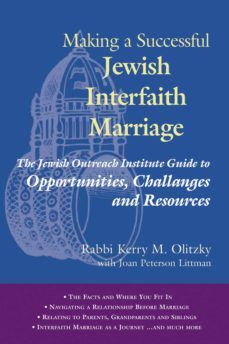 > From a Jewish perspective, this book guides interfaith couples at any stage of their relationship—from dating and engagement, to the wedding and marriage—and the people who are affected by their relationship in any way, including their families and counselors who work with interfaith couples. While making no judgments or dictating answers, and supporting individual choice, topics covered include: What is an intermarriage? Why do people intermarry? When do you bring up the subject of religion? What is conversion and is it necessary? When do you discuss and decide how children will be raised? … and much more!